To live well into your 90s, there are two things you might want to consider, says Hugh MacDonald. Eat his "secret breakfast" every morning and live in a "happy house." A mixture of different grains, nuts, seeds and yeast, the breakfast isn't really a secret; the nice folks at your local bulk-food store will let you have it without much coaxing. As for the "happy house," you'll have to find your own; Mr. MacDonald has lived in his for more than 50 years and has no intention of moving out. 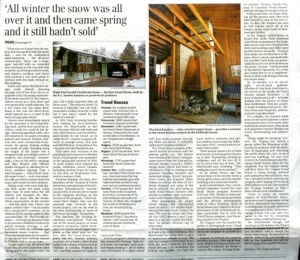 It was obvious to him when he first saw the 1,000-square-foot, wooden split-level at 48 Rathburn Rd. that a great deal of love and care went into its design. The house's modern look and layout immediately captivated him, as did the extensive use of open-grain woods. But what made it even more special is that it was the first so-called Trend House, destined to be one of only 11 ever built. The Trend House program was the brainchild of various British Columbia lumber-related industries and was initiated in the early 1950s to both capitalize on an increasing interest in West Coast post-and-beam housing styles and to combat sagging sales figures in Eastern Canada. In 1951, the group -- led by Cleve Edgett -- asked the modernist Vancouver firm Sharp & Thompson Berwick Pratt to come up with a design for an exhibition home, to be built for an international trade fair in Toronto the following year. In an in-house competition, the design of 30-year-old architect Fred Brodie was chosen. The structure was not built at the trade fair, however, but in the new Toronto suburb of Thorncrest Village, "where, it was hoped, the house would attract a broader cross-section of visitors," writes modern design curator Allan Collier in a research essay on the program. Hugh MacDonald was among 200,000 visitors to the house in the summer of 1952. He fell in love with it, as thousands of others likely did. "It struck you right from the first as being modern," he explains, a twinkle still in his eye. "The layout of the house, the openness of it, everything about it was the way a house that you want to live in for the rest of your life should be." Although not incredibly radical from the outside, the house did stand apart from its brick neighbours on Rathburn Road (then called Rosethorne Road) because of its long, boxcar-like shape. What also set it apart was the carport that ran parallel with the street and -- save for the cinderblock semi-basement -- the all-wood construction. There was a large, open balcony with an extended roof overhang on the east side that made for an inviting outdoor room, and window mullions and doors were painted a soft mint-green to contrast with the dark, vertical cedar cladding. Inside was where the house's design really shined. Entering through one of two front doors on opposite sides of a small, street-level vestibule attached to the carport, visitors stood on a slate floor and were greeted by a split staircase. Up a few stairs was the main floor, down a few was the lower-level, which opened up to a patio at the back via large glass doors. Visitors were immediately struck by the openness of the living/dining room, and by how much an architect could use wood in his design. Plywood-panelled walls were left unpainted, the grain providing pattern and texture; kitchen cabinets, too, were constructed of plywood; the gently sloping ceiling was made of cedar. Running along the length of the house was a dropped trellis providing a sense of coziness and enclosure. Interestingly, a few of the trellis openings had light fixtures with diffuser shades dropped in, allowing for indirect ambient lighting. Only a brick fireplace -- with a bold, riveted copper hood -- and a few painted walls provided contrast from the many and varied wooden surfaces. Sitting at his well-worn teak dining table under the same trellis more than 50 years later, the still athletic and energetic Mr. MacDonald is much like his house. While conservative on the outside -- with his silver hair, blazer and open-collared shirt -- on the inside he's complicated, eccentric, yet as warm as all the woody surfaces that surround him. Mr. MacDonald explains -- between his frequent trips to fetch items of interest such as his prized wooden carvings, a self-published book on evolution and his recent tennis trophies -- that when the house went on the market in the fall of 1952, nobody wanted it. Nobody, that is, except him. "It just didn't sell. All winter the snow was all over it and then came spring and it still hadn't sold," he says, still a little surprised after all these years. "The reason it hadn't is because it basically had one bedroom and a smaller room for a child but it just wasn't suited for the needs of a family." In 1953, baby booming families were looking for three-bedroom houses. Mr. MacDonald, at that time 43 years old with wife Sally and only child Bonnie, had the perfect-sized family for the house, so he called the B.C. lumber company directly to arrange terms. One year and $20,000 later, Trend House No. 1 became the MacDonald house. Norman Dusting, the then vice-president of the Council of Forest Industries, was secretary of the B.C. Lumber Manufacturers Association in 1954. It was his job to report to the company directors on the success of the program. "I did it because Cleve Edgett, who was the principal man involved in the whole project, was on the road at the time participating in some of the house openings," he explains. The directors, Mr. Dusting remembers, were pleased. "That was one of the initial projects of wood products promotion which developed into much, much bigger programs as the years went on," he says. After the Trend House program, the B.C. lumber industry would go on to build a show home using timber-frame construction at Olympia in London, England, in 1957 and then expand yet again to Japan and China. And the program's influence was felt, assures Mr. Dusting: "Split-level houses, for example, [and] post-and-beam housing -- all of which were developed to a great extent with that whole program through the fifties and sixties. It definitely influenced Canadian builders." The Trend House program influenced interior decorators and the general public, too. The houses were furnished by Eaton's using designer pieces from the National Industrial Design Council's (NIDC) design index, which had been established in 1948 to catalogue and promote Canadian furniture and industrial design. Russel Spanner, Peter Cotton, Jan Kuypers, Julien Hebert as well as the firm of J & J Brook designed just some of the pieces selected, the goal being to outfit Trend House interiors with articles as modern, light and innovative as the homes themselves. After purchasing his empty Trend House, Mr. MacDonald knew he had to use similar furniture so it wouldn't look "heavy," he says. "We were in touch with Ottawa [the NIDC] about it and I suppose in a way we copied the furniture," he admits between sips of white wine. To see the house today is to see it as it was at the 1952 exhibition. Mr. MacDonald has done little to alter its appearance inside or out. The only real changes have been to enclose the open balcony for year-round use and to modernize the bathtub and toilet. The light fixtures, built-in cabinetry and various surfaces showcasing the different types of B.C. wood products remain untouched. "Most people spend a lot of time and money on keeping their houses up to date. Repainting, putting up wallpaper and all the rest of it; we've never had any of that," Mr. MacDonald says, beaming. "That ceiling has never been touched." As an added bonus, age has turned most of the interior wood a honey-gold colour and the exterior cladding a rich chocolate brown. In the United States, Arts + Architecture magazine hosted the Case Study House program between 1945 and 1962. Thanks in large part to the power of the American media and the glorious photographic work of Julius Shulman, most of these homes stay lodged in the consciousness of the international design community. 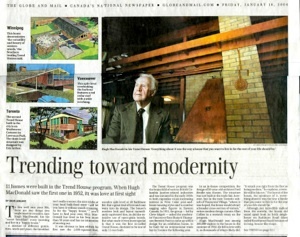 Not so with the Trend House program, says Winnipeg architect Jim Wagner. Mr. Wagner, who has made it his hobby to photograph every Trend House in Canada, was never taught about the program in architecture school. Instead, he learned of it quite by accident during a 1988 trip to England. While browsing in a little second-hand bookstore, he found a curious full-colour, 32-page booklet entitled "Western Woods Present 10 Canadian Trend Houses" and was intrigued enough to buy it. A few years later, he began looking up the houses each time he'd find himself in one of the host cities. To date, Mr. Wagner has seen or had reports about all of the houses except those built in Montreal and Halifax. As Mr. Wagner visited them, he found that unlike their American Case Study counterparts, the Canadian houses had since blended into their surroundings and didn't give up their history as readily. "If you go look at the one in Edmonton or Regina, they're pretty unremarkable; you wouldn't pick them out particularly from the rest of the houses on the street," he says. "And if you look at the one in Vancouver, it's a very nice house but it's in a neighbourhood of other well-designed houses not too far away." So, in essence, it's an out-of-sight, out-of-mind problem. Whether it's the fault of architectural schools or the media, the Trend Houses remain footnotes -- if they're mentioned at all -- in books dealing with the history of Canadian modernism. They are, as writer Adele Freedman has put it, "history of the near-forgotten, undocumented, Canadian kind." It's a shame, too, because while most of the houses present a rather conservative face to the street, their method of construction, floor plans and innovative interior finishes are worth documenting and preserving. Things might be changing, however. Mr. Wagner has started a group called the Winnipeg Architecture Foundation with the intention of cataloging and educating the public about his city's stock of post-war buildings. He may even contact the family living in the Winnipeg Trend House, since it's his suspicion that the original family still lives there.The Calgary Trend House is being lovingly restored and updated by Michael Kurtz, who has a detailed website showing his progress since buying the house in 2002 (where you'll also find scans of the 32-page booklet) at http://www.mkurtz.com/trendhouse. Closer to home, the Ontario chapter of DOCOMOMO (Documentation and Conservation of the Modern Movement) has begun assembling a list of people interested in learning more about these fascinating houses You can add your name to the list by contacting James Ashby at jashby@mnsi.net. Mr. MacDonald, though, will continue to tell anyone who'll listen about his happy house and his secret breakfast. And to ensure the house stays happy, he promises to tell Mr. Ashby if he ever decides to sell, so that someone else will be able to enjoy it for another 50 years.